When we think of suburban dwellings, our minds generally stray to run-of-the-mill houses that are often lacking a sense of individuality or uniqueness. Malvina Reynolds had it fairly accurate when she wrote and composed her 1962 hit 'Little Boxes', which rather flawlessly articulated the monotonous urban sprawl of suburbia. Therefore, it is always a pleasant surprise when we tour a dwelling that challenges this banal, dime-a-dozen, and consistently mediocre architectural medium. Designed by Andre Pacheco, the home in question boasts a clean yet unassuming façade, with subtle glimpses of glamour and refinement. The dwelling is a successful exercise in cleverly juxtaposing a sense of innate classicism with a contemporary construction, and the results are spectacular. Designed as much for family as it is for lavish entertaining, this abode transforms the idea of suburban living into something opulent and luxurious. Today we are lucky enough to take a tour inside this versatile and delightful residence, so come with us and gain a little domestic inspiration for your own home renovation! From the outset it is clear that this dwelling is no ordinary suburban property. 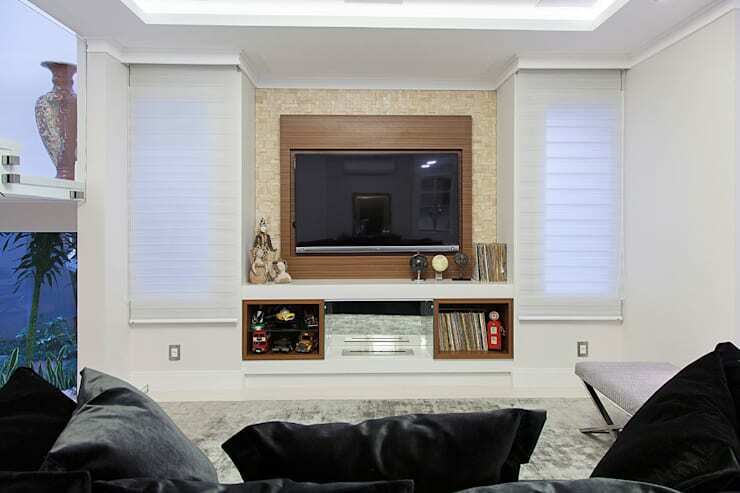 The home oozes subtle sophistication, with a neutral yet impressive colour scheme. One of the most recognisable features of this house is the twin columns that provide a clear and impressive entrance for those visiting or coming home. 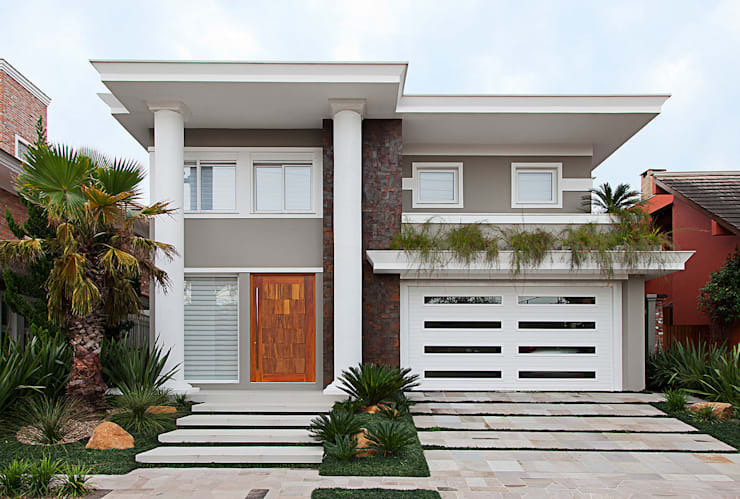 Additionally, the use of plants throughout the design has beautifully improved the dwelling's cohesion with the surrounding environment. On the first floor balcony we see grasses delicately overhanging the garage, while the perfectly manicured garden is lush and stylish. The contemporary front door boasts an attention grabbing appearance, and we simply cannot wait to see what lies inside these four walls. Let's check it out now! As we enter the home it is very clear to see the gorgeous juxtaposition of classic and contemporary. Here the aesthetic is one of a welcoming nature, which is enhanced by a sense of impressive opulence and luxury. Finishes are sparkling and high gloss, evoking a sense of lavish refinement throughout. The statement light fitting is of particular note, as it injects both heritage finesse and elegance, while also feeling rather modern and in keeping with the contemporary ambience. Furthermore, the designers have chosen materials and textiles that suit both modern dwellings, as well as instilling a sense of timelessness and age-defiant class. 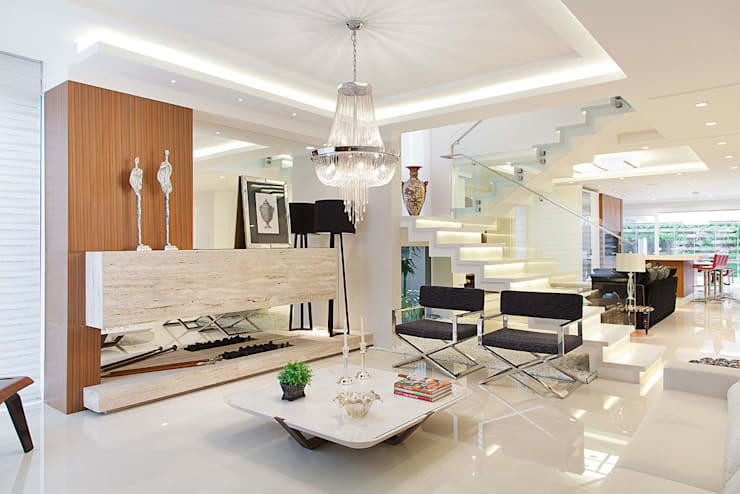 Glazed balustrades ensure movement throughout the different living zones, while high-gloss stone flooring presents a feeling of wealth and sumptuous living. This room has almost too many characteristics to mention, with each element and standout feature carefully considered and thoughtfully implemented. Next up, we enter the sleek and slick cooking area. This is a truly minimalist kitchen, with all of the essentials tucked away in ample cupboards and storage spaces. The kitchen is utilitarian and appears as less of a feature within the house. This is probably due in part to the fact that the other entertaining areas are given centre stage, with the kitchen providing a perfunctory yet no less stylish cooking area. The colour scheme is white with neutral tones, including elements of mushroom and ecru thrown into the mix to enhance the overall vibe. 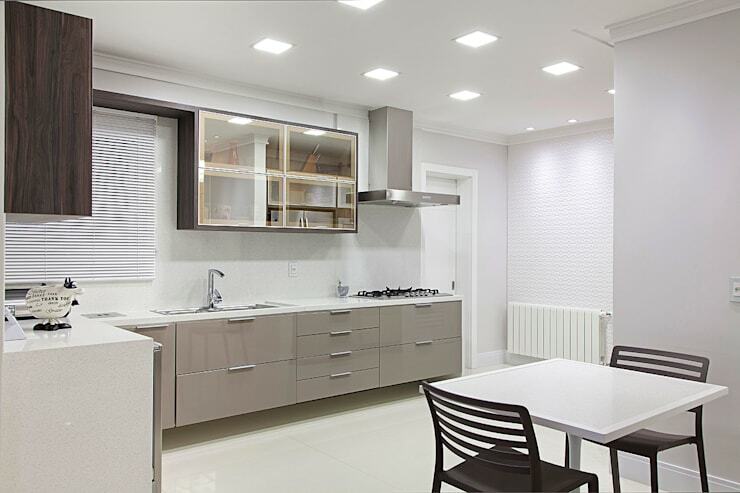 Stainless steel appliances complete the luxuriant look, exuding lavish practicality. While the kitchen is unassuming and simplistic, the indoor bar and entertaining space is the complete opposite! Bright, lively and boasting a huge area to entertain, this wonderful room is a feast for the eyes. 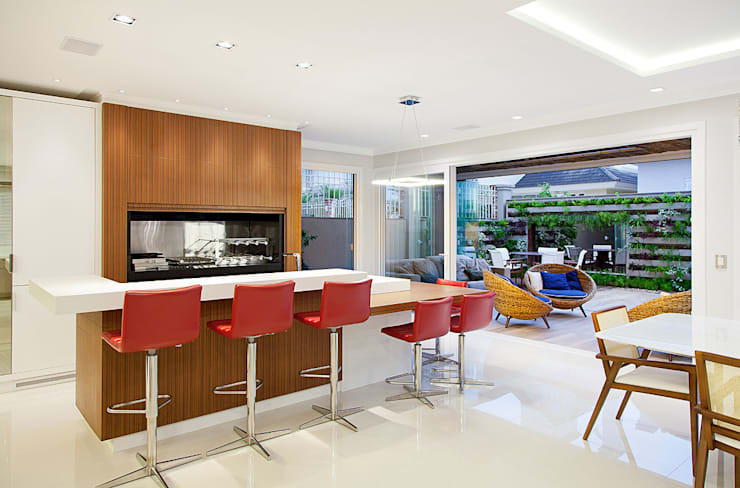 The colour scheme is still a bright white hue, but is instead paired with a contrasting timber-clad bar, replete with vivacious red bar stools. Through this room we can also peek briefly into the exterior entertaining area. Here the room is both indoors and out, with bi-fold doors able to be closed during inclement weather. We love the bright primary colours that are employed throughout, giving this a playful yet sophisticated aura and ambience. Within this home we see luxury items and finishes paired beautifully with family-friendly essentials. Here in the television space this is extremely evident. The thick shagpile rug is effortlessly comfortable, while the overstuffed seating is additionally lavish and enticing. Perfect for children to sit and watch a film, or for the parents to cuddle up for a romantic evening, this is the ultimate in versatile, luxurious living. Creating a space that is both user-friendly, as well as stylish can be a tricky and challenging task, if you need some help, chat to an expert via homify and get the advice you need. Finally, and to top off this impressive tour, we arrive in the garden. 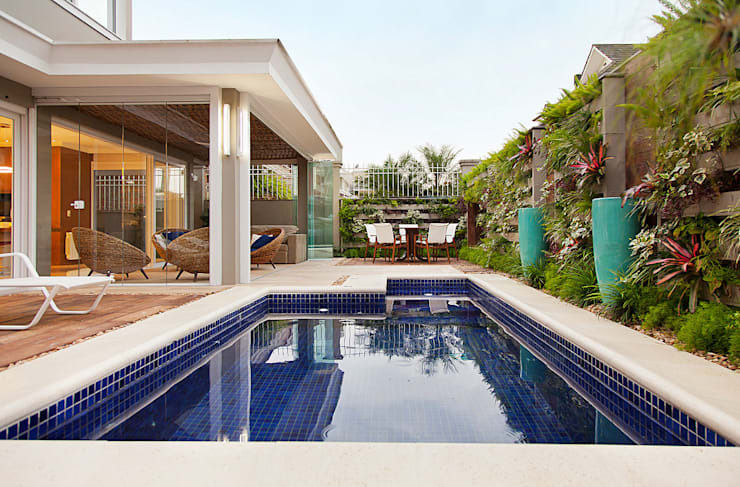 The best part of the home is located in the garden, as it houses a sparkling ultramarine swimming pool. This would definitely become the family's favourite place to spend time together, boasting a gorgeously comfortable living space, dining, as well glazed walls for parents to watch children while they are swimming. The outdoor zone is functional and versatile, with the architects utilising bi-fold glass doors to create an all-weather area. Definitely our preferred space in this property, we'd love to know which area is your favourite too! If you would like some more inspiration, or to take a look at some more stylish interiors, check out The Butterfly Wing House.